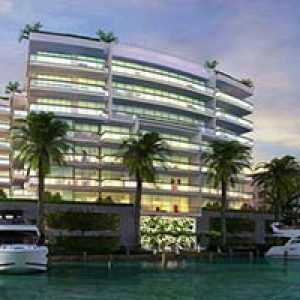 Latitude on the River is the latest and greatest project to grace the riverfront in Downtown Miami. Located on the shores of the Miami River at 185 7th St., Latitude on the River is close to the best of Miami both east to west and north to south. With 427 total units in the stunning downtown skyscraper, Latitude on the River currently has studios, one, two, and three bedroom floor plans available for purchase. Luxury studios with 451 square feet of living space start at just $188k, a bargain for Downtown Miami luxury condominiums. Larger three bedroom models with 1,486 square feet of living space sell for just $645k, also a great value considering the neighborhood and amenities. Latitude on the River is just one block away from Miami’s iconic Calle Ocho and aims to take on the ambiance of old world Miami. Modern elegance and luxurious amenities all come standard including nine foot ceilings and floor to ceiling glass windows. The natural light allowed in from these beautiful and expansive windows creates efficiency in heating and cooling as well as a seamless transition from indoor to outdoor living spaces. Ultra-luxurious penthouse models feature cavernous 12 foot ceilings. All residences at Latitude on the River come standard with Snaidero Italian made kitchen cabinetry and imported granite countertops. Master bathrooms come with imported marble floors and pedestal skins. In addition to the beautiful interior design of Latitude on the River, the community amenities provide the very best of Downtown Miami luxury living. Imagine your very own Riverwalk Promenade with direct access to gateway plaza. The lushly landscaped pool deck and meditation gardens are a great place to relax after a long day. The pool area comes complete with an Infinity Edge pool. Latitude on the River features two floors of state of the art fitness equipment from Selectorcize as well as men’s and women’s sauna facilities for post workout rehabilitation. The Grand Party Room has catering services available for your guests. The 12th floor is an entertainment center complete with a billiards room, residents’ lounge, and bar. Relax that your family and property are safe with 24-hour security. The Location of Latitude on the River puts you right in the middle of all of the best Downtown Miami has to offer. You’ll be right around the corner from a rich Miami culture and the Cuban Exile History Museum. The Shops at Mary Brickell Village are nearby and feature designs from some of the world’s top fashion experts. Relax or take in the beautiful riverfront sites at nearby Jose Marti Park. The River Walk Trail is just a few blocks away as well with miles of path for bike riding or jogging. Downtown Miami luxury living has reached new heights with Latitude on the River.